The Komets played their 35th consecutive season in the IHL in 1988-89. The franchise was owned by local businessman David Welker. Welker, owner of Hoosier Culverts and W&W Concrete, purchased the Komets out of bankruptcy court for a paltry $300,000 in the summer of 1987. The Komets, coached by former player Robbie Laird, had numerous affiliations that year. The Komets were a farm team of Boston, Quebec, Washington, Winnipeg and Edmonton. Quite a group of parent clubs! As you can tell, the team had radically changed their look over the course of the 1980s. The traditional orange and black jerseys with the fireball logo were long gone. 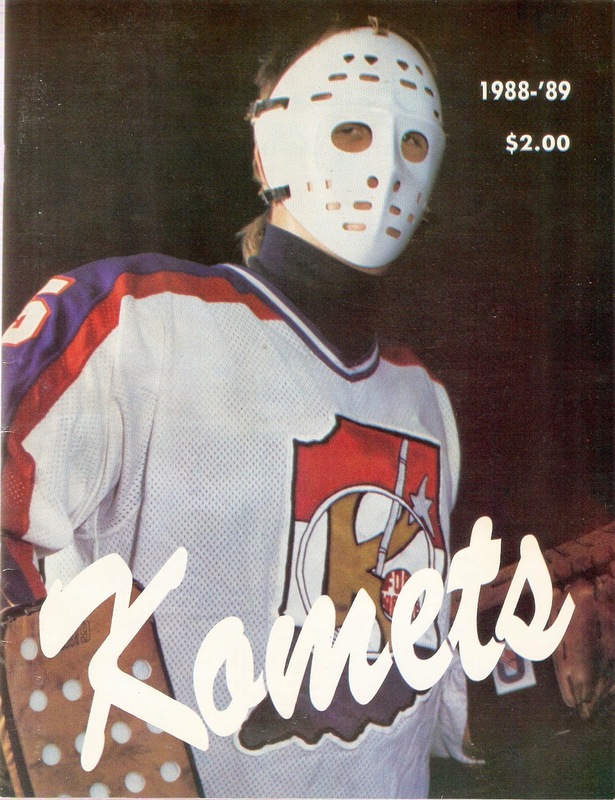 In their place, were red-white-blue unis with a silhouette of Indiana (the Komets script on the front of the program was on the road jerseys). They also had a koala bear for a secondary logo, which was supposedly for non-alcoholism and "A2D2" (Athletes Against Drunk Driving). Coach Laird's Komets finished the 1988-89 season with a 46-30-6 record. Their 98 points were just four points behind second place Saginaw, but 23 points behind league-best Muskegon. Fort Wayne had a weak offense that season, as their 293 goals were second-worst in the IHL. Mike McNeil, in his rookie season as a pro, led the team with 27 goals and 62 points. Keith Miller was just behind him with an even 60 points, on the strength of a team-high 35 goals. Only three other players scored at least 20 goals. Future Komets coach Al Sims had a respectable 30 points on defense that season. Speaking of defense, the Komets were significantly better. They allowed a miniscule 274 goals, tops in the league by 20. Fort Wayne used five different goaltenders that year. Long-time minor leaguer Rick Knickle played in 47 games that year, going 22-16-5 with a respectable (for the time) 3.11 GAA and 1 shutout. Future NHLer and former Michigan State Spartan Bob Essensa made it into 22 games, going 14-7-1 with a 3.26 GAA. Stephane Beauregard (another future NHLer), Steve Averill and Al Loring also saw action in the Komets net. This first program is from a regular season game on October 29, 1988, vs. the Flint Spirits. It was the team's 2nd Annual Halloween Celebration (which the Komets hoped to "spook the Spirits"). Kids 12 and under that dressed up in a costume were let in for free and got to parade around the ice during the second intermission for prizes! The rest of the program is 42 pages long, mostly black-and-white, with ads ranging from Northeast Indiana Chevrolet Dealers to the Kings Tavern. Very nice program, and whoever the goalie was in the picture had a great mullet! The Komets qualified for the Turner Cup Playoffs for the fourteenth consecutive season in 1988-89. They faced the Saginaw Hawks in Round One, who had qualified for the postseason each year since 1970-71 (as the Flint Generals). Fort Wayne knocked off the Hawks in 6 close games, outscoring Saginaw 17-12 in the process. They then locked up with the Muskegon Lumberjacks in Round Two. Despite falling in 5 games, the Komets kept the series close, as four of the five games were decided by 2-3 goals and one went to OT. The Lumberjacks would go on to win their second, and final, Turner Cup over Salt Lake. The program on the right is from Game 2 of the Komets-Lumberjacks series, on April 29, 1989. Muskegon won the game, 4-2, to take a 2-0 series lead. This program is almost identical to the first one. It's 40 pages, almost all black-and-white. Ads include such things as Saylor's Pizza, Schenkel's All-Star Dairy, and Valley Outlet Center. 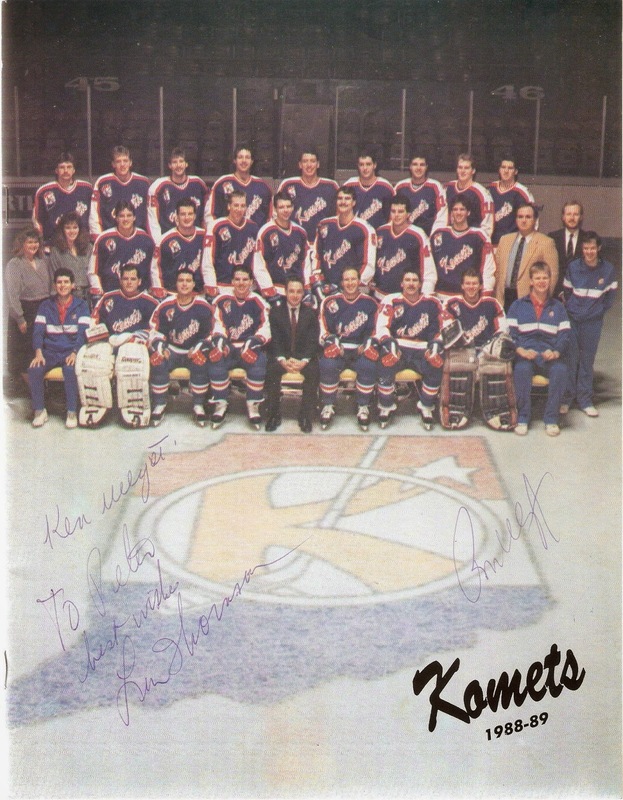 As you can see, this program was autographed by three different Komets legends: Ron Ullyot, Ken Ullyot and Len Thornson. Bob Essensa is the goaltender on the left. Aftermath: The original Komets would last for one more season, finishing in last place in the East. Their mediocre 37-34-11 record got them into the postseason again, but they were quickly knocked off by Muskegon in Round One. Attendance, a problem for several years in Fort Wayne, continued to decline, as a poor economy and general dislike of owner David Welker kept fans away from the Coliseum. Welker finally threw in the towel and moved the franchise to Albany, New York, renaming the team "Albany Choppers". Welker's move caused controversy in not only the IHL, which didn't approve of it beforehand, but also the AHL, which didn't appreciate the rival league invading it's territory. In any case, Welker's Choppers bombed in Albany, folding by Valentine's Day, 1991. Shortly after Welker left, the Franke Family purchased the Flint Spirits, moving them to Fort Wayne and assuming the Komets' name and history. They also brought back the traditional orange-and-black unis and fireball logo (the koala bear didn't survive, sad to say). The Frankes continue to own the Komets to this day, now in the ECHL.